Mosh engineered at the Icehouse. Includes a booklet with introduction and short stories written by Dominic Fripp. Track postitions are listed sequentially (1-13) on the rear cover. Some 25 years on, this remains a beautiful, sublime and timeless piece of work. I was very lucky to find a sealed copy a few years ago, which is now a treasured part of my collection, having only previously owned a CDr copy. There are a few comments on this page about a repress and on balance I probably agree - if it were to be done, then it should be done over 3 x LP, because I feel that on the inside tracks of the 2 x LP, there is a reduction in sound level / quality which would be my only crticism of the original version. In any case: masterpiece, classic, timeless - no amount of adjectives really do this justice - the music speaks for itself. Absolutely dumbfounded that this record has not been reissued since a late 1990s cd reissue. Please, please reissue on vinyl. REPRESS PLEASE PLEASE PLEASE PLEASE PLEASE PLEASE PLEASE PLEASE PLEASE PLEASE PLEASE PLEASE PLEASE!!! The booklet starts by stating this is a work of "duo-sensory fiction." What this means (I figured this out when I started to wonder..."What if you try to read the booklet exactly along with the music?") is that there are cues in the text that line up with samples/events in the songs. At first it seems like it's working, then not, but as you adjust your reading pace you will realize the entire booklet matches the entire CD. It's incredible. Really one of the most amazing works I'm aware of once this is taken into consideration (and it's already one of the best electronic albums ever made!). I cannot for a single moment fathom why I sold my copy of this many many years ago. One of the best albums ever made. Indeed...as stated below, this album really is an incredible piece of music. Like md said before me, i also first heard this on one of Colin Dales outer limit shows in 93, though i believe it was the track ahn he played that night, it was nothing short of beautiful, and i couldn't wait for its release and hear more. It didn't disappoint in any way then and it still doesn't now, some 20 odd years later, the perfect soundtrack for the best sci-fi movie yet to be made. For me its up there with the best of them. I'm pretty sure that after having listened to music for over 40+ years that this record is tied with Joy Division's 1st 2 albums for my Greatest Album Ever Made. It is just completely perfect in every way, I wouldn't change a single note of it. Every so often a record comes along that leaves you astonished at the power and creativity of the human mind - this one is it. Early 90's electronic music released ahead of it's time remaining a marvel listen even today, 17+ yrs later. A truly classic release that has not dated one bit. 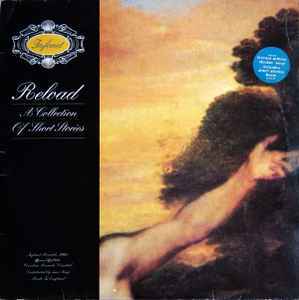 Reload, aka the famous ambient group Global Communications, create a modern technology driven listen into futuristic, experimental, science-fiction ambient-Idm-techno with some added intelligent breakbeat. A truly impressive lisenn that's produced with the highest of quality aimed to stimulate all areas of the mind! This certainly is no dance album but more a thought provoking listen that manages to provoke many emotions and feelings taking you on a unexpected, original, & compelling journey through moody, dark, thoughtful, spooky, intense, and calming moods & atmospheres. A Si-Fi story booklet is also included with the CD, complimenting the music, and a very good read itself. Each track plays its own Si-Fi chapter telling parts of a mini story through music that will keep you wondering in what the next track (chapter) will bring next - just don't expect a main predictable theme on this album! Tracks have a variation in pace, approach, mood, atmosphere, & style - yet hold the album together incredibly well while complimenting & working as part of the albums Si-Fi concept bringing ideas, variety, and originality together embracing the listener into its unique listening experience across its sweeping melodies, industrial noise, breakbeats, light & dark tones, spacey ambient, alien soundscapes and everything else that sonically can be thrown at you - inc the kitchen sink! This truly is a album of electronic sophistication musically designed with thought, originality, and creativity that seems to have come from a now desolate but once a technological Si-Fi future...NOT TO BE MISSED!